Our Blessed Mother always said, “Yes.” This “Yes” was her fiat of perfect love. 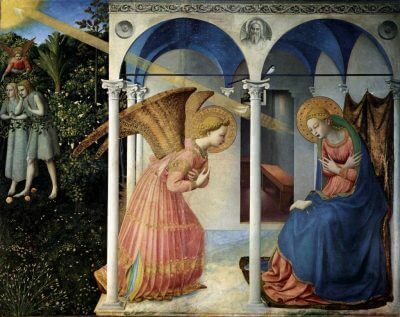 At the Annunciation, the Archangel Gabriel revealed to her the beginnings of the life of the Savior of the World. The Archangel revealed that she would be His mother and He her Son. Our Blessed Mother inquired with openness and submitted without reserve. Mother Mary’s fiat resounded throughout her life. Though faced with the great mystery of the Incarnation, she submitted with free and total consent to the will of God. As a result, God became one of us, incarnate in her immaculate womb. Though her Son was God and was perfect in every way, He chose to imitate her perfect fiat as He agonized in the Garden of Gethsemane. That night, just hours before His brutal Crucifixion, He fell on His knees and cried out, “Father, if you are willing, take this cup away from me; still, not my will but yours be done.” His prayer was one of perfect surrender to the will of the Father in Heaven. But it was more than that. His prayer also united Him ever more deeply to His own beloved mother. This prayer in the garden echoed Mary’s fiat to the Father at the Annunciation. Just as His mother had said “Yes” to the will of God, so did her Son the night before He died. As our Blessed Mother stood at the foot of the Cross, she would have pondered the union of her fiat with that of her Son. She would have seen that this moment was the culmination of their united surrender to the will of the Father. Reflect, today, upon your own surrender to God. Say with Jesus and our Blessed Mother, “Let it be done unto me according to your word.” And, “Not my will but yours be done.” Pray these prayers and know that you are saying “Yes” to the Cross. By entering into this great mystery of our faith, you are offering your life in union with the Son and His mother. Do not hesitate. Offer yourself freely and you will be blessed to be at the foot of the Cross, gazing at our Lord with our Blessed Mother. Dearest Mother, as you stood at the foot of the Cross and recalled your own perfect “Yes” to the will of the Father; you became immediately aware of what that “Yes” truly meant. It meant total sacrifice, surrender and death to all in this world. It meant you believed in the will of the Father above all earthly goods. It meant you chose to trust at a depth divine grace alone could make possible. Draw me in, dear Mother, to your perfect fiat. Help me to say those words with you as I face the mysteries, hardships, crosses and sufferings of my life. Give me the vision of your faith so that I may have hope and trust in all things. My Precious Lord, I choose to live Your perfect surrender and to make it my own. Grant me the grace to be one with You as You were one with the Father in Heaven and one with Your own dear mother. I love You, my Lord, and I give myself to You without reserve. Let it be done to me according to Your most holy will. Mother Mary, pray for us. Jesus, I trust in You.